We planned our visit to the Severn Valley Railway to coincide with a weekend event re-enacting sights and sounds of the 1940s in Britain. Susan and I were born in 1945. Our fathers were flying instructors in the U.S. Army Air Corps during World War II and both men trained some British pilots. The wartime theme sounded interesting. Our trip back in time began outside the station in Kidderminster, where WWII soldiers and nurses made their way past military jeeps and pre-war civilian vehicles to enter the station. Inside we found guards checking identity papers, newsagents selling wartime magazines and newspapers, a replica air raid shelter, a station cart full of pots and pans being collected for their valuable metals, and lots of memorabilia and signage from the '40s. Almost everyone was wearing a uniform or some other period clothing. We even saw "Winston Churchill" puffing on a big cigar and conferring with high-ranking military brass. This was one of the few rainy mornings we encountered during our stay in England, but wet weather didn't spoil anyone's fun. The trains were busy all day, hissing and puffing from Kidderminster to Bridgnorth and back with stops in between at Bewdley, Arley, Highly, and Hampton Loade. In the early afternoon, the sun returned and shown in a brilliant bue sky. It looked a lot like the early 1940s at Kidderminster Station. Rain made for misty departures and arrivals at Bewdley. served as decoys for enemy bombers in WWII. Sheep graze in pastures beside the Severn River near Highly. Bewdley Station (left) and Highly Station (right). Arley Station appears at top of this page. to the other at Bridgnorth. A departing train heads south. No. 43106, built in 1951, is one of SVR's seven operational steam locomotives. The line from Kidderminster to Bridgnorth is about 16 miles long. The distance between stops varied from 2 to 4.5 miles. Trains ran frequently, allowing us to visit each station, enjoy the exhibits, shop for souvenirs, dine, converse with fellow travelers, and take lots of photos. There was much to see, including railway musuem collections at Highly and Kidderminster. For this weekend, however, there were extra exhibits and activities related to the 1940s theme. 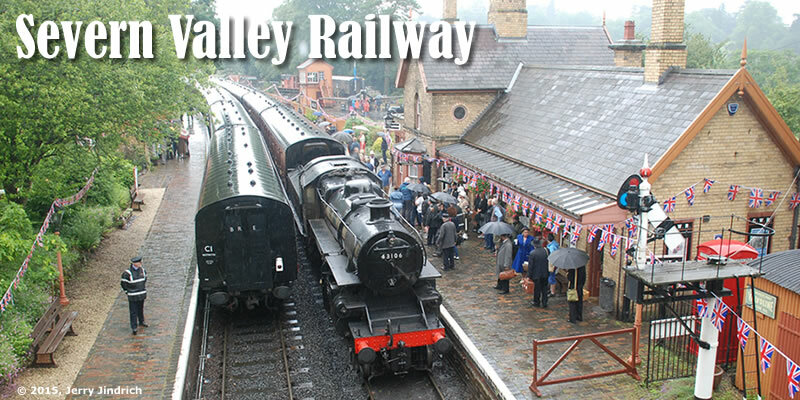 We spent the entire day on The Severn Valley Railway and recommend it highly.